3D printing, also known as additive manufacturing, is considered a key technology for improving space vehicle designs and lowering the cost of manufacturing -- which in turn will make space exploration more affordable. It's a technology that could be used not only for rockets and launch vehicles here on Eart, but probes and landers visiting other planets or moons. Now, a NASA team has moved a step closer to building a completely 3D printed, high-performance rocket engine. By manufacturing complex engine parts and test firing them together with cryogenic liquid hydrogen and oxygen, the engine they have built was able to produce 20,000 pounds of thrust. Future plans include performing engine tests with liquid oxygen and methane--key propellants for Martian landers since methane and oxygen production might be possible on the Red Planet. We manufactured and then tested about 75 percent of the parts needed to build a 3-D printed rocket engine. 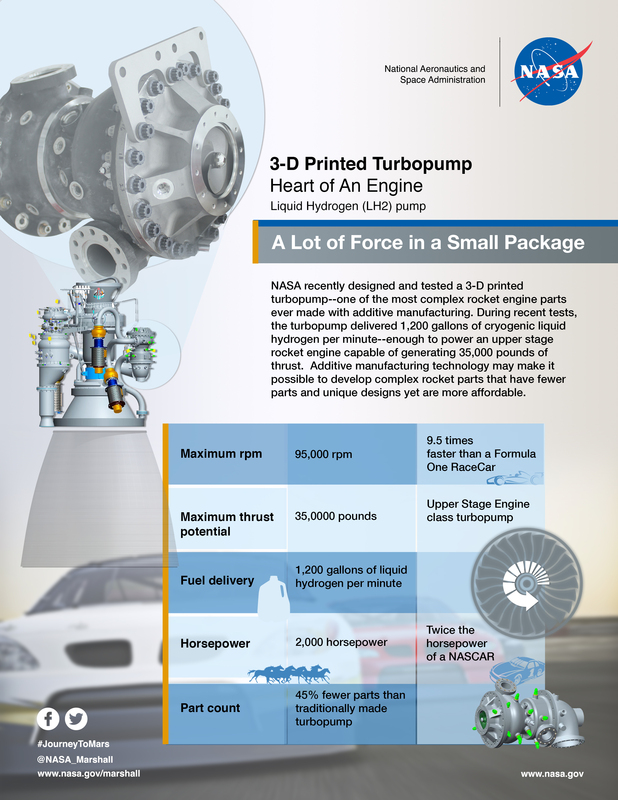 By testing the turbopumps, injectors and valves together, we’ve shown that it would be possible to build a 3-D printed engine for multiple purposes such as landers, in-space propulsion or rocket engine upper stages. Over the last three years, the Marshall team has been working with various vendors on 3D printing rocket engines and the parts they need, such as turbopumps and injectors, and testing them individually. To test them together, they connected the parts so that they work the same as they do in a real engine. Only they are not put together in a way that looks like the typical engine you see on a test stand. In engineering lingo, this is called a breadboard engine. What matters is that the parts work the same way as they do in a conventional engine and perform under the extreme temperatures and pressures found inside a rocket engine. The turbopump got its “heartbeat” racing at more than 90,000 revolutions per minute (rpm) and the end result is the flame you see coming out of the thrust chamber to produce over 20,000 pounds of thrust, and an engine like this could produce enough power for an upper stage of a rocket or a Mars lander. Seven tests were performed with the longest tests lasting 10 seconds. During the tests, the 3D printed demonstrator engine experienced all the same extreme environments inside a rocket engine in flight where fuel is burned at greater than 6,000 degrees Fahrenheit (3,315 degrees Celsius) to produce thrust. These tests were performed with cryogenic liquid hydrogen cooled below 400 degrees Fahrenheit (-240 degrees Celsius) and liquid oxygen, propellants that are mainstays of spaceship propulsion systems. Even if methane and oxygen prove to be the Mars propellant of choice, the propellant combination of cryogenic liquid hydrogen and oxygen tests the limits of 3D printed hardware because it produces the most extreme temperatures and exposes parts to cryogenic hydrogen, which can make any material extremely brittle. In addition to testing with methane, the team plans to add other key components to the demonstrator engine including a cooled combustion chamber and nozzle and a turbopump for liquid oxygen. These NASA tests drive down the costs and risks associated with using additive manufacturing, which is a relatively new process for making aerospace quality parts. Vendors who had never worked with NASA learned how to make parts robust enough for rocket engines. What we’ve learned through this project can now be shared with American companies and our partners. To make each part, a design is entered into a 3D printer's computer. The printer then builds each part by layering metal powder and fusing it together with a laser – a process known as selective laser melting. The 3D printed turbopump, one of the more complex parts of the engine, had 45 percent fewer parts than similar pumps made with traditional welding and assembly techniques. The injector had over 200 fewer parts than traditionally manufactured injectors, and it incorporated features that have never been used before -- they are only possible with additive manufacturing. Complex parts like valves that normally would take more than a year to manufacture were built by in a few months. This made it possible to get the parts built and assembled on the test stand much sooner than if they had been bought and made with traditional methods. Marshall engineers designed the fuel pump and its components and leveraged the expertise of five suppliers to build the parts using 3D printing processes. This new manufacturing process really opened the design space and allowed for part geometries that would be impossible with traditional machining or casting methods. For the valve designs on this engine, we used more efficient structures in the piece parts that resulted in optimized performance.